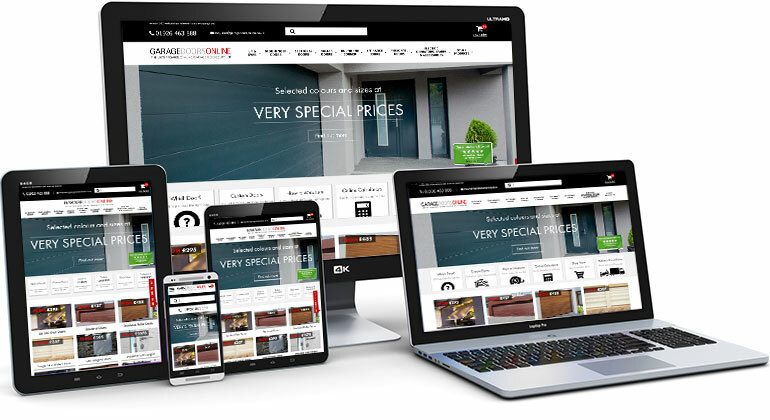 Garage Doors Online came to us for a new start-up ecommerce website venture in 2007. Since then the website has become very successful; it has been progressively developed and has grown to be a £multi-million turnover business, as well as the UK's No 1 ecommerce site in its sector. Garage doors are an astonishley complex product, much more than either we or most people might expect (and we've produced a large number of ecommerce sites, so we know they are about as complex as they get). This is because each manufacturer tends to do things differently, with different sizing ranges and option, but very importantly, large numbers of what we have called 'contingent options', ie where a specific choice of size makes available to the buyer a unique selection of further options which may not be the same as for other sizes, even of the same base product. This can also happen in multiple levels, so the complexity is enormous. Our brief was to produce a system which accommodated all this extreme variability, as well as allow customers to customise their size requirements for bespoke installations. No other garage door website had this functionality on the planet. We were also tasked with coming up with branding and an initial corporate identity, as well as working with the client on the business name, SEO and web marketing, which were also deemed very important. The name 'Garage Doors Online' was agreed out of many possibilities, and we followed that with a modern logo, branding and initial website concepts which were all agreed. The same branding is still in place today, whereas the website itself is on its 4th design iteration, with the latest about to go live as of writing, with a fully response 1st class design. At launch in 2007, the new website had by far the best functionality and ease of use of any ecommerce site in the sector in the UK. Today (more than 9 years later) its functionality still surpasses all its competition, who have not been able to deal with the complexities of the product, and therefore resort to only offering a limited standard selection. The site has been continuously developed since the initial launch, including producing a bespoke mobile version. Our SEO service started at launch as well, and quickly catapaulted the site into the Google top 10 for its main search phrase targets, and eventually achieving the No 1 position for 'garage doors'. By 2010 it was clearly the UK's No1 ecommerce website in the sector, and it has stayed there, in spite of huge changes in the internet and Google. Today the site is No1 on Google for 'garage doors', and has 200 top10 rankings, generating more than a million page views per month. A new website is currently being constructed that will be the most significant design change yet. It will be fully responsive and be closely optimised for all the main resolutions large and small, and include a number of major user experience (ux) improvements, which we are confident will keep the website in its top position well into the future.